Congratulations. You just received the best Christmas gift in the world—a new baby! While the holiday season may be the busiest time of year and sleep is something you daydream about and you haven’t even started your Christmas cards, you still want to share this blessed event with friends and family. We understand—we’ve been there! 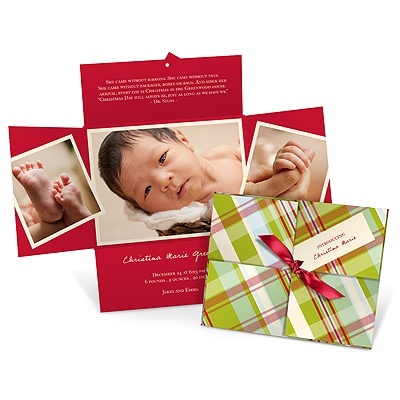 That’s why we created a special line of Christmas birth announcements for families just like yours. These unique birth announcement ideas combine holiday messages with on-trend design and plenty of photos to make your holiday birth announcement sing “Joy to the World!” And since this is a holiday card from the whole family, many of our designs incorporate several photos that allow you to show the whole family along with your new bundle of joy. 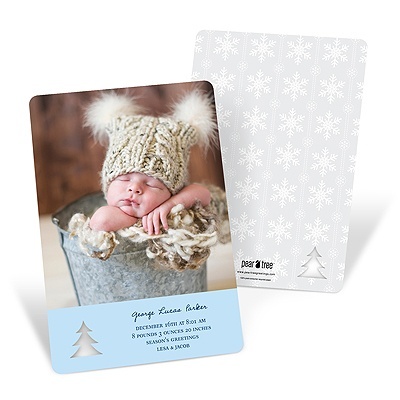 Some families, especially if this is their second child, choose to send winter baby announcements and Christmas cards separately so that one can focus on the baby and the other can be a greeting from the whole family. Either way is perfectly acceptable. The important thing is that you get some sleep! Look for more baby announcement ideas on our blog, or browse our Christmas birth announcements and get inspired to create your own special holiday version!